ACS Central Science, Volume 4, Issue 9, Pages 1146–1154, 2018. PepTSo is a proton-coupled bacterial symporter, from the major facilitator superfamily (MFS), which transports di-/tripeptide molecules. 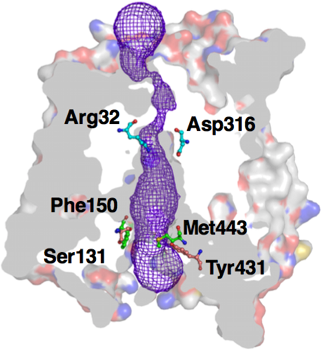 The recently obtained crystal structure of PepTSo provides an unprecedented opportunity to gain an understanding of functional insights of the substrate transport mechanism. Binding of the proton and peptide molecule induces conformational changes into occluded (OC) and outward-facing (OF) states, which we are able to characterize using molecular dynamics (MD) simulations. The structural knowledge of the OC and OF state is important to fully understand the major energy barrier associated with the transport cycle. In order to gain functional insight into the interstate dynamics, we performed extensive all atom MD simulations. The Markov state model was constructed to identify the free energy barriers between the states, and kinetic information on intermediate pathways was obtained using the transition pathway theory (TPT). TPT shows that the OF state is obtained by the movement of TM1 and TM7 at the extracellular side approximately 12–16 Å away from each other, and the inward movement of TM4 and TM10 at the intracellular halves to 3–4 Å characterizes the OC state. Helix distance distributions obtained from MD simulations were compared with experimental double electron–electron resonance spectroscopy and were found to be in excellent agreement with previous studies. We also predicted the optimal positions for placement of methane thiosulfonate spin label probes to capture the slowest protein dynamics. Our finding sheds light on the conformational cycle of this key membrane transporter and the functional relationships between the multiple intermediate states.